In a heatproof bowl in the microwave, melt sweetened condensed milk, butter, and Nutella. Transfer half of the mixture into another heatproof bowl. Add bittersweet chocolate to one bowl and white chocolate to the other bowl. Microwave each bowl in 30-second increments, stirring after every 30 seconds (to prevent overheating) until melted and smooth. Stir in half of the hazelnuts into each bowl. Work quickly to avoid the mixtures from becoming muddy. Dollop the light and dark chocolate mixtures alternately into the pan like a chess board. When done, insert a knife all the way down and start swirling the batter. Don’t swirl too much. You don’t want the colors to blend together. 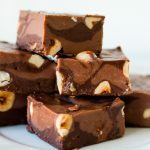 Keep fudge in the refrigerator until completely set, about 3 hours. Cut into squares.